Landscaping with boulders is just natural in a Colorado rocky mountain landscape. Being based in Evergreen, Colorado, where natural boulder outcroppings are common and boulders are everywhere, we use boulders in landscape projects frequently. We often use moss-rock boulders to create natural looking boulder outcroppings, in water features, to accent planting beds, or to just add detail throughout a landscape design. 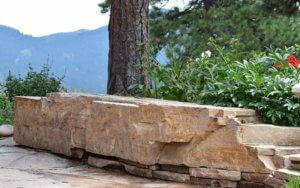 Evergreen Landscape & Design specializes in boulder placement design and installation. Boulder placement is an art form and we have many years of experience with installing boulders with machines. Designing with boulders comes very natural to us as we have done hundreds of jobs over the years using them. We often use moss rock boulders in a landscape around Evergreen CO, since every naturally existing boulder outcropping in Evergreen is moss rock. There is a variety of other boulders available to use such as grey granite boulders, cobble boulders, gold ore boulders and more. We also install natural stone stairs using flat boulder slabs. Boulder slabs installed as stairs create staircases that blend wonderfully into a mountain landscape. Stone slab stairs climbing between boulders is a very appealing look and will last a lifetime. Water features are installed using boulders of all different shapes and sizes. Placing larger boulders on the perimeter of a water feature give the water fall that natural rocky mountain appeal. Flatter boulders give water a cascading path to follow, and provides a tranquil sound. Landscaping with boulders in Evergreen, Colorado, just fits with our mountain environment. However, boulders are also used effectively in more urban landscapes as well. Installing boulders in planting beds or to create height in an otherwise flat landscape, adds depth, height and dimension to an outdoor space. Landscaping with boulders around patios or walkways will add interest to the spaces. Using boulders in a landscape is a very common and important element in Colorado landscape. You simply will not find a more experienced company when it comes to installing and landscaping with boulders in Colorado.